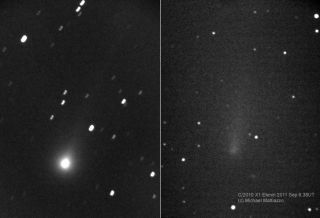 Amateur astronomer Michael Mattiazzo of Castlemaine, Australia caught these two images of comet Elenin on Aug. 19 (left) and Sept. 6, 2011. The images show a rapid dimming in the comet, possibly hinting at its disintegration. Russian amateur astronomer Leonid Elenin had the good fortune to discover a comet on Dec. 10, 2010, and it's turned out to be quite a skywatching curiosity. Initially, comet Elenin received quite a bit of attention from astronomers because its orbit would take it quite close to Earth, within 22 million miles (35 million kilometers), on Oct. 16, 2011. It looked like it was going to put on a good show. Then, disaster struck in the form of a coronal mass ejection from the sun. The next day the comet had dropped half a magnitude in brightness, and has continued to drop, despite the icy body getting closer to the sun. Apparently the comet is disintegrating, as sometimes happens when comets pass too close to the sun. Meanwhile, this rather small and ordinary comet has become the subject of media frenzy among conspiracy theorists and 2012 doomsayers. Comet Elenin has been accused of being a brown dwarf or the mysterious and destructive planet "Nibiru," and has been blamed for earthquakes and tsunamis. Did you know that its discoverer’s name is really an acronym for "Extinction Level Event: Nibiru Is Nigh?" The next day, Mattiazzo managed a couple of images in the evening twilight sky as the comet dropped too close to the sun to be followed any further. The comet was a faint ghost of its former self. Since then, the comet has been lost to view because of its faintness and its proximity to the sun in the sky. If all had gone as planned, the comet would be moving into the field of view of one of the cameras on NASA's Solar and Heliospheric Observatory (SOHO) satellite on Friday (Sept. 23). If so, the big question is: what will SOHO see about this comet? Most people look at the images from SOHO for the rich information they supply regarding the sun. However, the wide-field images also show the sun against the starry background on the far side of the solar system. Careful comparison of the images in SOHO to the images in planetarium software allow you to identify the background stars, and watch the planets pass behind and in front of the sun. This sky map of comet Elenin's path shows the situation on Friday, as the remains of the comet enter SOHO's field of view from the left. The bright stars Zaniah and Zavijava of western Virgo should be easy to see, but brilliant Mercury will dominate the images on the right. Elenin will pass Zaniah on Sunday (Sept. 25) and Mercury on Tuesday (Sept. 27), before moving out of SOHO's field of view on Thursday (Sept. 29). At this point, no one can predict exactly what we will see through SOHO's eyes in the coming week, but everyone will have the chance to watch using one of NASA's brightest eyes on the solar system. If comet Elenin survives its close encounter with the sun, it will become visible in morning twilight towards the end of the first week of October. Editor's note: If you snap an amazing photo of comet Elenin or any other skywatching target and would like to share the experience with SPACE.com for a possible story or photo gallery, please contact managing editor Tariq Malik at: tmalik@space.com.